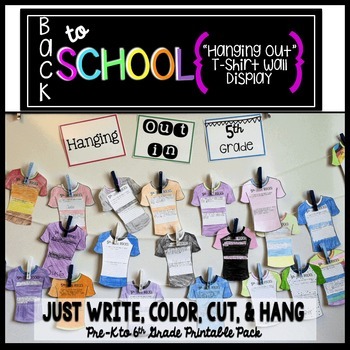 Get your Back-to-School display ready with this easy print and go set! This printable pack includes two printable t-shirt pages per grade level (preschool- 6th grade), one with writing lines and one blank; both ready to use for display or individual worksheets. 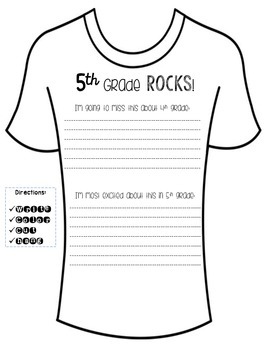 This set also includes 8.5" x 11" posters that read, "Hanging Out in (Grade Level)"
Each grade level printable t-shirt is titled "(Grade Level) Rocks!" On the writable shirts, second through sixth grade's include a section to write about what students will miss about their previous grade and what they're excited about for the current grade. Preschool through first grade's writable shirts include a section to write about why they're excited for their current grade. Each grade level's blank shirts only include the t-shirt with its title. You might also like this fun Back-to-School Bingo and Writing Activity! Permission is granted for single classroom use only (copying and distributing).